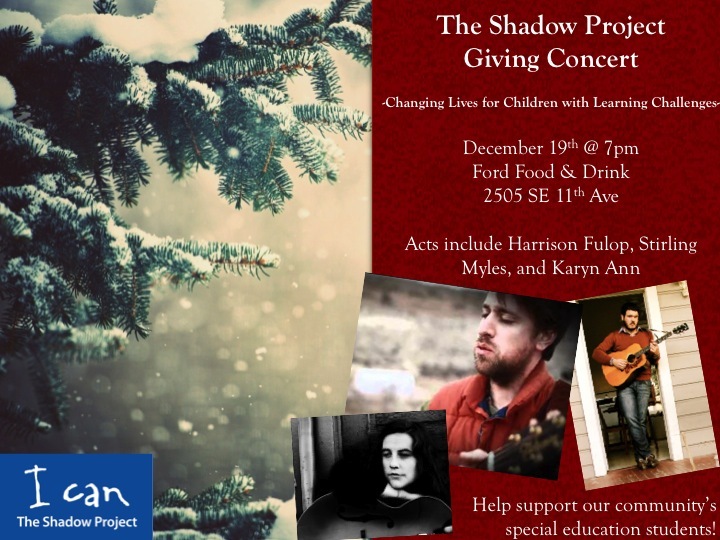 Come celebrate the season of giving with us at our Shadow Project giving concert! The concert will be held at Ford Food and Drink (2505 SE 11th ave), from 7-10 PM December 19th! Acts include Harrison Fulop, Stirling Myles of Alameda, and Karyn Ann. Come hear these wonderful musicians play and support the Shadow Project! We are in the Willamette Week Give!Guide again this year and throughout the evening you will be able to donate through the giveguide.org on your phones or on the tablets we’ll have available. Help support our community’s special education students!